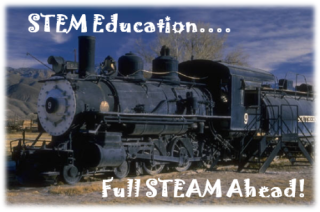 Welcome to a post devoted to turning STEM to STEAM. It is exciting to cover the topic of STEAM since it is important to include the Arts. I have also included 25 resources to help make it happen! It actually is quite obvious that the Arts should be included in STEM education. A look at the works of Leonardo da Vinci will attest to this! The very first time I heard the idea of integrating the Arts into STEM education was while watching a keynote made by Daniel Pink at the NECC Conference in Washington DC… yes prior to ISTE Conferences! Pink presented strong evidence that educators must include right brain lessons in addition to the inclusion of historical left brain activities. A reading of his book, A Whole New Mind: Why Right-Brainers Will Rule The Future, is a must for any educator, especially those interested in STEM education. It is evident that inserting the A (Arts) in STEM and creating STEAM allows for true innovation, and it is innovation that will allow students to be successful in a flat world. Bringing the Arts to STEM allows students to remember the creative juices that come with the smell of a Crayola Crayon, the engagement of Tinker Toys, and the creation and remixing of that first Easy Bake Oven. It is the STEAM that allows students to not just be technology consumers, but technology creators! Proper infusion of the Arts will create a STEAM culture that engages and promotes intrinsic learning. In the space below I have included some sites that may just allow educators to integrate the Arts, allowing STEM to become STEAM! While there is a lot of talk on STEAM Education, it is difficult to find a lot of material. I hope you enjoy what I have gathered and please let me know what I should include in an up-date post. NPR Where Science Meets Art - Some exceptional Podcasts integrating Science and Art. Many of these titles will allow for student reflection and questions as they begin to see how the Arts and Science can be integrated. How to Smile - Discover this group of science museums dedicated to bringing science, technology, engineering, and math (STEM) out of the academic cloister and into the wider world. Find new ways to teach kids about math and science. Discover activities that meet you where you live, whether your “classroom” is an active volcano, the shark tank at the local aquarium, or your own kitchen table. SMILE is collecting the best educational materials on the web and creating learning activities, tools, and services. Discover Engineering – Innovation is important and must be part of any STEM curriculum. At this site you will discover a video that showcases the art of engineering? You may find a hands-on activity that covers some amazing STEM content.? There is a large database of sort-able ideas for you to engineer in your classroom. PBS Learning Makers Party – Thus initiative encourages people around the world meet up, learn to make things, and share what they’ve made online. This wonderful collection is designed to support the Maker Party by providing a one-stop shop of STEM and digital making resources that focus on the problem, technology, or process behind object creation. DIY –A great way for kids to get skills, innovate, and meet others who share the same passions Kids can make their own portfolio where they share what they make and do. They also earn embroidered skill patches for completing sets of challenges. Educators may wish to consider starting a DIY Club or DIY Classroom. Makey Makey – OK… it is not free, but it is very inexpensive. Students can let their imagination run wild as they construct new games and even possible put together a band where their instruments are fruit. Why Scientific Innovation Needs The Arts – Explore this wonderful article from the Guardian that explains the connection of science and the arts. Great read to support STEAM thinking in any educational setting. Odyessey of the Mind – This international educational program provides creative problem-solving opportunities for students from kindergarten through college. Team members apply their creativity to solve problems. Autodesk Digital Steam Workshop - Digital STEAM projects are designed by Autodesk’s network of expert educators, designers and student alumni as exciting complements to core Science, Technology, Engineering, Math, and Art (STEAM) curriculum. Each project aligns with common core and national standards, and delivers measurable learning while using free software. PBS Design Squad Nation – Turn the innovation on in your classroom. Use Design Squad Nation activities, animations, video profiles, and episodes in classrooms and after-school programs, in libraries and museums, at events and at home. This will engage your students in some amazing activities. Space School Musical – Your students will enjoy joining teenager Hannah on a trip through the solar system in this ultra-cool edu-tainment “hip-hopera” that uses song and dance to introduce the planets, moons, asteroids and more. Educators can download the lyrics for students to learn and perform the routines for themselves or just play the videos in class. There are also links for more in-depth activities. ArtSTEM – Claims to be a site where the Arts and Humanities meet the STEM Disciplines. Wonderful collection of blog posts that contain both writing and multimedia to display the Art in Science. Scratch – With Scratch, kids can program their own interactive stories, games, and animations — and share your creations with others in the online community. Scratch helps young people learn to think creatively, reason systematically, and work collaboratively . All of this is possible while essential skills for life in the 21st century are facilitated.. Scratch is a project of the Lifelong Kindergarten Group at the MIT Media Lab. It is provided free of charge.